Openreach project co-ordinator Billy Whitelaw with pupils from St John the Baptist Primary School. Pupils from three West Lothian primary schools were all superfast in finding out the benefits of fibre broadband when the Digital Scotland Fibre Showcase paid them a visit this week. More than 10,000 households and businesses in West Lothian can now access high-speed fibre services thanks to the Digital Scotland Superfast Broadband programme. 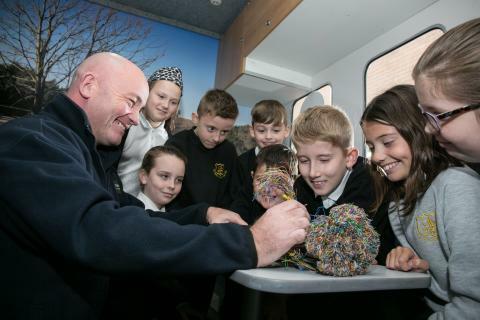 Pupils from the three schools – St John the Baptist RC in Fauldhouse, and Addiewell and St Thomas’s primaries in Addiewell – climbed aboard the Digital Scotland Fibre Showcase, a unique vehicle which features equipment used in the roll-out of fibre broadband. Hundreds of premises in Fauldhouse and Addiewell are now able to access the new high-speed services. Local people need to sign up through an internet service provider, as upgrades are not automatic. The local premises are among more than 660,000 homes and businesses across Scotland which are now able to access fibre broadband through the £410 million Digital Scotland rollout. Other local areas to benefit from the programme include Breich, Linlithgow Bridge, Blackridge, Uphall, Wilkieston and East Mains Industrial Estate in Broxburn. More local coverage will follow as engineers from Openreach, BT’s local network business, continue work on the ground. Sara Budge, Programme Director for Digital Scotland Superfast Broadband, said: “It’s great news that many residents and businesses in West Lothian are now able to receive fibre broadband thanks to the programme, with more local coverage to follow. Liz Mallinson, BT Scotland’s Fibre Broadband Director, added: “Coupled with our commercial upgrades, nearly 60,000 premises in West Lothian now have the opportunity to access their best ever broadband speeds when they sign up with a service provider. “There’s lots of competition out there and people may find they could be surfing at much higher speeds at a similar cost to their current service.